We’re taking the wraps off the latest NuVoodoo Ratings Prospects Study to share with the industry starting on Tuesday, February 19. That’s the kickoff for the first installment of our Spring 2019 Webinar Series. This fresh sample of over 3,000 persons, ages 14-54, across all PPM markets responded to what we think is our best questionnaire yet. Smart Speaker trends: was this past holiday season was another good one for Alexa and Google Home? Are terrestrial stations getting traction in their attempts to get listened to on Smart Speakers? Advertising channels that likely ratings respondents pay attention to. 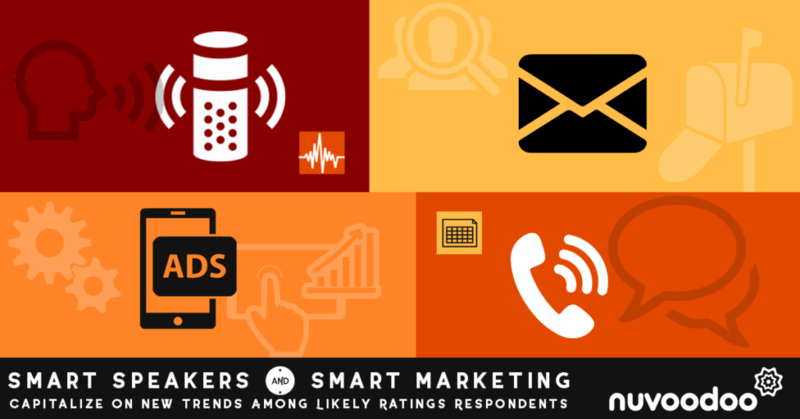 Marketing messages and tactics that have prompted likely ratings respondents to listen more. Which Social Media platforms are used most by panelists and diary keepers? What are the key differences between Social Media platforms by demo and format partisans? Have Social Media developed trust issues with radio listeners in light of negative publicity? Are increasing data privacy concerns enough to cause likely ratings respondents to seek alternatives to Facebook? We promise we’ll give you all the pertinent information in just 30 minutes – and we’ll stick around to answer questions if you have time to stay “after school.” Our first session is on Tuesday, February 19 at Noon Eastern and there are four more sessions over the following two weeks to make sure there’s a session that fits your schedule. Register at nuvoodoo.com/webinars/.